DOCX is a document file format used by Microsoft Office 2007. DOCX is an Open XML document file with no macros. All versions of Microsoft Office from 2007 onwards use the DOCX format. DOCX files can also be accessed using other free to use word processing programs like OpenOffice Writer, ONLYOFFICE etc. PDF files are an attractive alternative to DOCX files as they are easy to share, smaller in size and can be accessed in almost all operating systems. PDF file can also have additional security features like password protection, content certification, digital signature etc. 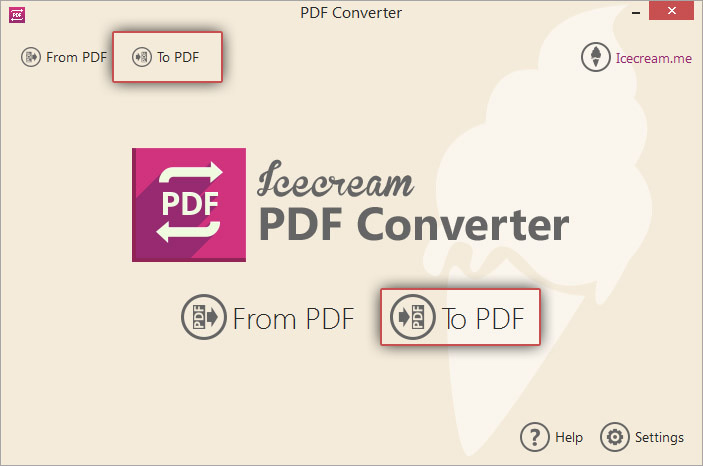 In case you are looking for a way to convert DOCX to PDF format, Icecream PDF Converter can easily do that for you. This application also allows easy conversion of documents from various other formats to and from PDF as well. Files can be easily converted from DOCX to PDF in 4 easy steps as described below. 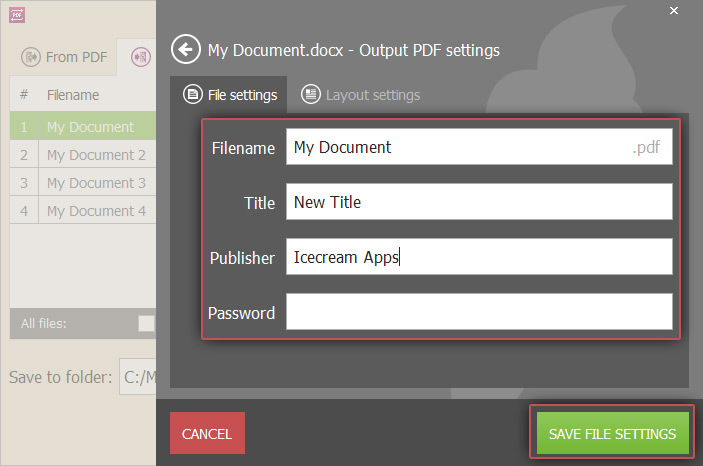 Download Icecream PDF Converter application from its webpage to start the process. Follow the easy instructions in the setup wizard to complete the installation of the application. You are now ready to add your DOCX files and proceed right to conversion. 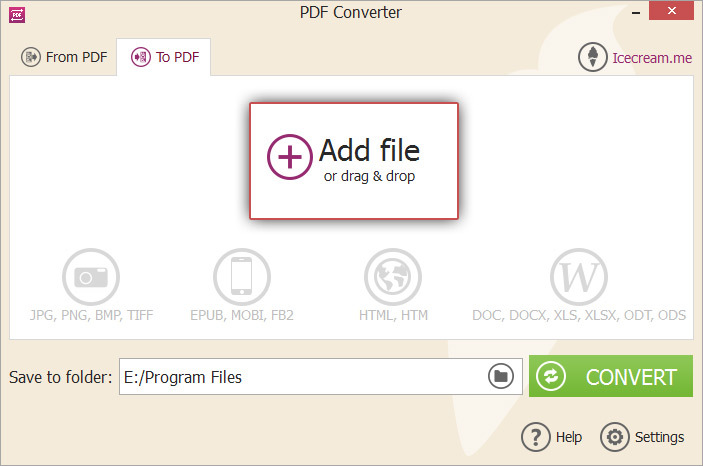 Open the installed application and select the “To PDF” option from the home screen. Use the “Add file” button to select the DOCX files from the local machine by meand of Windows Explorer, or drag and drop the files directly to this window. To add more DOCX files click on the Plus (+) icon in the right hand side or use drag and drop mechanism. Hit the settings icon beside a needed file to open the settings panel and set additional conversion options like the new filename, new title of the PDF document, password and publisher information. These settings can also be applied to all the added files, to do that click on settings icon at the bottom of the files' list. Press the “SAVE FILE SETTINGS” button to save your changes. Press “CLOSE” to exit from this panel without saving. If you wish to merge the contents of all the added DOCX files into a single PDF document, you can do so by checking the “Merge all into one PDF file” option. The sequence of the individual file contents can be specified using the UP and DOWN arrow buttons or by dragging and dropping them to the right position. The new PDF file will contain the information from the DOCX files in this sequence. To remove a single DOCX file from the list, click on the DELETE icon beside the file. Click on the “CLEAR ALL” button to remove all the added files. The next step is to specify the destination folder where the output PDF files will be placed. Click on the folder icon in the “Save to folder” field to select a destination folder of your choice. Converted from DOCX to PDF files will be saved in this folder. If all the needed files are added, their sequence and settings are correct, simply press the “CONVERT” button to convert added files to PDF. Progress bar will appear indicating the current status of conversion along with other details, like the current file being converted, the page number and the elapsed time. Use the Pause/Resume buttons to pause or resume the conversion process at any point of time. To terminate the conversion, press the Cancel button. When all the files have been converted successfully, confirmation message will be displayed. Click on the OPEN FOLDER option in the message to open the folder where the PDF files are saved. You have now successfully converted your files from DOCX to PDF with Icecream PDF Converter.